Adam Simmons and Vikram Iyengar in The Calling. Coming to a performance without baggage is impossible, just as leaving that behind when writing a review can’t be done. But one way to judge any work of art is surely to ask whether and where it has taken us; down which paths, if any, has it prompted us to explore. I came to The Calling having watched all except one of Adam Simmons’ short, explanatory videos prefacing this concert he describes as being “in four parts, with little bits in between”. As these videos explain, in this work he— with significant help from his Creative Music Ensemble and the Afrolankan Drumming System duo — explores themes of identity and belonging by drawing on his first visit to his mother’s homeland, Sri Lanka. My parents were not born overseas. But I can identify a little with Simmons’ search for identity — he was born in Chelsea and grew up in a mix of Ballarat, Upwey and Westall before making Melbourne his home; I was born in Bairnsdale and grew up in Clayton, Orbost, Berwick and Horsham before moving to the city. It is quite a different experience from living only in one place. You tear up roots and move on, from security briefly fashioned to its absence. Simmons clearly felt a more profound absence that drew him to Sri Lanka in 2016, a connection that he felt drawn to make with part of his cultural heritage. The most affecting part of these prefatory videos, I felt, came in Simmons’ account of his experience at the temple in Kandy, Sri Lanka. Amid the populous bustle and noise of this place where people queued to see the site of the tooth of Buddha, he found a connection with his mother’s birthplace — a gentle smile that conveyed love, acceptance and welcome. That experience inspired Part 4 of The Calling, entitled Connection: The Tooth of Buddha. It resonated with me before I heard the music. Many years back when visiting that temple in Kandy I had a totally different, yet moving experience. Early on a still, cool morning, I wandered in those spaces free of people, absorbing the place in a kind of meditative exploration. My reverie then was broken only when a resident monk offered me a leaf-wrapped packet of sticky rice. The warmth and kindness of that simple act has remained with me. There is not so much of a quietly meditative nature in the performance of The Calling. This work bristles with percussive variety, conveying the vibrancy, life and vitality found often in Sri Lanka. Three transitional interludes employ imaginatively different approaches to bring train journeys into sharp relief, conveying via sounds and visuals the urgency of getting somewhere, the insistent patterns of wheels in motion, resonant whistles wailing into the distance and the colour and busyness of passenger interactions. Ray Pereira and Kanchana Karunaratna drum up a storm. Hugh Harvey and Ray Pereira in The Calling. The Calling: Nat Grant, Hugh Harvey, Ray Pereira, Kanchana Karunaratna, Howard Cairns, Miranda Hill, Niko Schauble, Adam Simmons, Gideon Brazil, Bryn Hills, Paul Simmons, Gemma Horbury, Pete Lawler, Gavin Cornish, Carmen Chan. Of the four main compositional offerings, three offer a richly percussive mix of energy and intensity — the rhythms of life writ large. In the opening piece, The Calling, Ray Pereira (djembe, conga, dundun) and Kanchana Karuntaratna (gata bera, thammattama) provide a virtuosic spectacle that varies in tempo and intensity, competition and congruence. These two musicians who form The Afro-Lankan Drumming System are serious and exuberant as they converse via their instruments, displaying lightness and rapidity, dexterity and finesse. It is hard not to be mesmerised. Eventually Niko Schauble and Hugh Harvey add their drums to the mix before wailing horns build the feel of a street parade or the madness of traffic. It develops into an occasionally discordant melee of resplendent mayhem. In Part 3, Living: The Dance of Kottu Roti, an array of instruments combines to convey an unsettling but glorious cacophony of hammering, knocking and tinkling —bustle and chatter, colour and movement. So much is happening that we can only let it wash over us like a carnival, tasting and savouring flavours and smells. Niko Schauble, Adam Simmons, Gideon Brazil and Paul Simmons. Vikram Iyengar moves into the performance of The Calling. Vikram Iyengar moves among the musicians. Vikram Iyengar connects with Adam Simmons. Vikram Iyengar and Adam Simmons connect. Part 4 brings us to that Kandi temple, drums and cymbals signalling drama, helped by horns. On soprano saxophone, Simmons becomes the focus in a riveting solo, grabbing deep gasps of air to power sighs, wails and sonorous, almost plaintive notes. It is as if making a connection to deep cultural roots is not easy. It may require effort, perhaps anguish. Gradually we become aware that only one instrument is playing, that the mayhem has subsided. 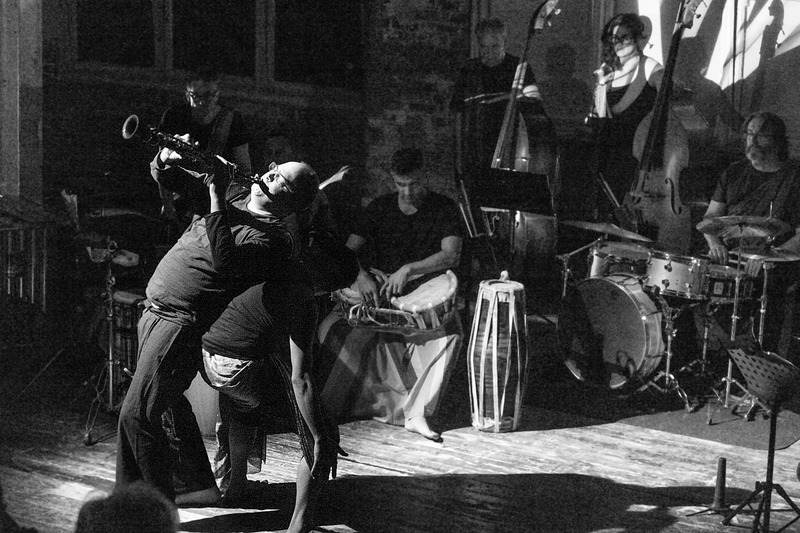 A dancer, Vikram Iyengar, moves slowly and purposefully among the musicians to connect with and ultimately support Simmons in his soliloquy. Yet this is a relationship of mutuality — the player and the dancer lean on, and gain support from, each other. Almost too starkly lit, it is a most powerful image. Three sharp drum beats bring us back to what must be the crowded, noise-filled temple. The only portion of this work that offers a less frenetic perspective is Part 2 – Place: The Pearl. Here Nat Grant and Carmen Chan on vibes draw us deep into the landscape, into ancient history and into the luxuriant humidity of a fecund rainforest. Eventually a slow melody delivered by the horns takes on a hymn-like feel, solemn and a little wistful. Deep notes draw us to the earth. There is a feeling that we are touching the heart of this land. The strongest image of The Calling, for me, was that of Simmons supported wholly by Iyengar, symbolising his finding of a connection. The richest listening experience I found in Part 2, when place was tangible. It is impossible, and unnecessary, to compare The Calling with other concerts in The Usefulness of Art series. But this work of art well and truly passed the test of taking us somewhere, of prompting exploration. In The Calling, Adam Simmons shows that he found a significant part of his story. Yet, as he said while introducing the performance, it is worth asking how the treatment of disconnected people who have come to this nation may have been affected by our own displacements.